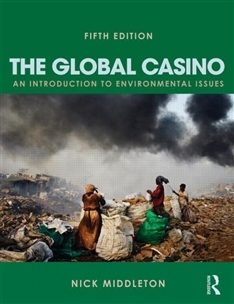 The Global Casino is a compelling introduction to environmental issues which links the physical environment to its political, social and economic contexts. Case studies from around the globe are used to illustrate key environmental issues, from global warming and deforestation to natural hazards and soil erosion. The book highlights the underlying causes behind environmental problems, including human actions and emphasises the potential for solutions. In line with contemporary international trends, emphasis is placed on the critical concept of sustainable development. This new edition has been thoroughly revised and updated, with the introduction of new illustrative material and up-to-the-minute case studies on topics such as endangered deep-sea species, the global uptake of unleaded petrol, geothermal energy in Iceland, genocide in Rwanda and the Indian Ocean tsunami of 2004. Particularly useful features for students include points for discussion at the end of each chapter as well as a comprehensive glossary. The lists of key readings and websites, again linked specifically to the content of each chapter, have been fully updated and expanded. The Global Casino is the essential course companion for students of the environment, geography, earth sciences and development studies.